Rest assured the rest of the book is a winner as well. “Señoras y señores, put your hands together for the fantastic, spectacular, one of a kind . . . NIÑO!” comes an announcement as Niño laces up his mask. What follows is challenge after challenge from out-of-this-world contenders. La Momia de Guanajuato! Cabeza Olmeca! La Llorona! El Extraterrestre! El Chamuco! None can defeat the mighty Niño and his creative wrestling maneuvers. Until . . .
Las Hermanitas! Fresh from their afternoon nap! They tackle. They hold. They tickle. They stop at nothing and nearly give Niño the ultimate in wrestling shame - an unmasking! Ah, but Niño didn’t become amazing and mighty by giving up easily. Will the mighty Niño take a mighty fall? Could Niño’s final match turn out to be his greatest victory? Tune in next week . . .
. . . or get your own copy of Niño Wrestles the World. At first I struggled with some pronunciations, but thanks to our resident Spanish II student (my daughter) and the book’s endpapers, reading the book like a true wrestling announcer is possible. 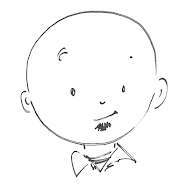 The endpapers feature pictures of each of Niño’s opponents along with their name, pronunciation, and description. 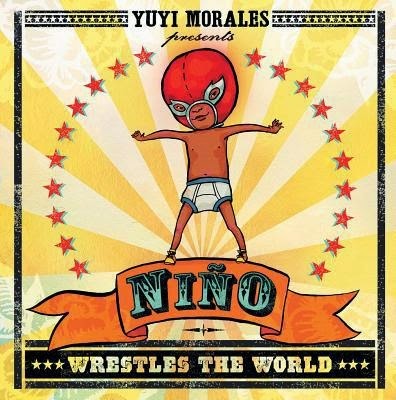 I thoroughly enjoyed Niño Wrestles the World, and I’m pretty sure that a great many kids will too, and not just those masked marauders in their briefs ready to take on all comers. Everybody gets tired of something, sometime. Teachers? Maybe it’s checking homework. Students? Maybe it’s completing homework. Kids get tired of cleaning their bedrooms while parents get sick of repeatedly reminding their kids to clean their bedrooms. But does that mean that you can just quit what you’re doing? Shirk your responsibilities? Sure, you might take an occasional break, maybe delegate some responsibilities. But quit? Yet that’s exactly what Duncan’s crayons decide to do in The Day the Crayons Quit. They’ve had enough. When Duncan goes to use his crayons, instead of finding them properly in their box he finds a stack of letters addressed to him. Each letter, one from each crayon, gives their individual complaints and reasons for quitting. Red complains of having to work harder than all the other crayons - all the fire engines and apples for instance - in addition to all the Santas at Christmas and the hearts on Valentine’s Day. Gray complains that all he gets to color is big stuff - elephants, hippos, humpback whales. All black gets to do is outlines. Nobody can even see white. Orange and yellow are in a snit over the correct color of the sun. Peach is embarrassed to be seen without a label, which Duncan tore off. And who knew purple was such a neat freak? His complaint? Coloring outside the lines. What could his idea be? What sort of creation could make all of Duncan’s crayons happy and still receive an A in coloring and an A+ in creativity? Don’t worry, Duncan’s got it covered colored. As readers progress through the book, each page presents another letter, handwritten in the matching color, with illustrations that show each crayon’s complaints. The book could easily be used with students. What other things might cause a crayon to quit? Could we write our own letters? Would markers be different than crayons? What if everyone in your art box - scissors, glue sticks, rulers - quit? What would their reasons be, and what would their letters look like? 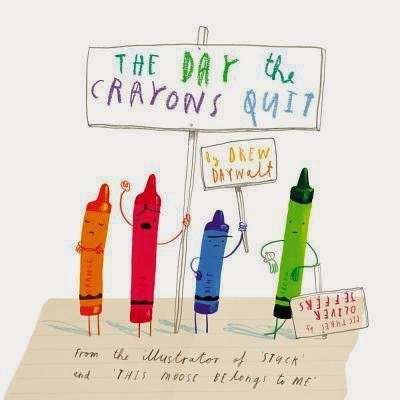 Even if you don’t use The Day the Crayons Quit by Drew Daywalt as the basis for some creative writing, the book works wonderfully as a read aloud and kids will never want to quit reading and rereading it.